First introduced to the little beastie .30 cal Carbine at about age 7 through my uncle. We have one of each make I believe, although it was a while since I last looked. All M1's no M2's or M3's. Various bits and pieces to go along with Carbine's as well. Great little gun to pop off goats on the charge!!! 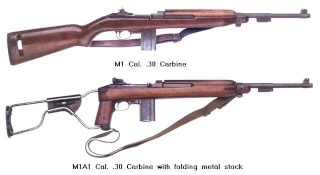 Welcome along, sounds like a nice collection you have, I think you should expect some questions from Mikey 51, he's a great fella, who is very passionate about researching M1's history. Great to see some new faces popping up. Welcome to the Club mate, good to have you aboard. I'm going for one of each manufacturer too, havn't quite got there yet but I do have duplicates of some. There's pictures of most of mine on here somewhere. Looking forward to talking to you. Mike, Wellington.